A first of its kind study led by Institute researchers has detected potentially harmful levels of gluten in foods sold and served as 'gluten-free' across Melbourne. The new study, published today in the Medical Journal of Australia, has revealed one in 11 samples of 'gluten-free' foods tested were contaminated with gluten at levels which could prove harmful to people with coeliac disease. The undercover testing was conducted at 127 food businesses across the municipality, testing 158 food items sold as 'gluten-free' by City of Melbourne environmental health officers, in consultation with Dr. Jason Tye-Din and a team of coeliac disease researchers at the Walter and Eliza Hall Institute. 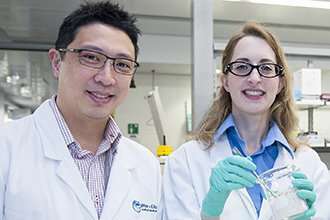 Dr. Jason Tye-Din, who leads coeliac disease research at the Institute and is a gastroenterologist at the Royal Melbourne Hospital, said that gluten contamination was a serious health-risk to those with coeliac disease. "For people with coeliac disease a strict gluten-free diet is their treatment, not a lifestyle choice," Dr. Tye-Din said. "Small amounts of gluten – even just a few crumbs – can be harmful over time and lead to issues such as osteoporosis or impaired growth." Dr. Tye-Din said the study provided the first objective evidence that foods offered by businesses as 'gluten-free' could contain harmful levels of gluten. "Previous evidence was only anecdotal with patients reporting getting sick after eating out. Our research not only validates these concerns, it also examines why gluten contamination might occur," Dr. Tye-Din said. "It is fantastic to see so many businesses offering gluten-free options in Melbourne and with the right awareness, training and practices this can be done safely and in line with the Food Standards Australia New Zealand (FSANZ) Code." Chair of the City of Melbourne's People City portfolio, Councillor Beverley Pinder, said the results serve as a reminder to food businesses to train staff, investigate their suppliers closely, and to take important measures to avoid gluten contamination. "This study is all about education – we want to safeguard members of the public who need to follow a gluten-free diet, as well as business owners who want to provide this option," Cr Pinder said. "The City of Melbourne is working with the food businesses found to have potentially harmful levels of gluten to help them ensure customers' safety in the future. "We want everyone who visits a food business across the City of Melbourne to feel safe and to know that if something says it's gluten-free, it actually is." "Gluten-free remains one of the top dietary requests and we urge all food businesses to treat gluten-free requests seriously," Coeliac Australia President Mr Michael Bell said. "The Coeliac Australia online training module was developed to educate hospitality staff and it highlights how even small changes to processes can help eliminate the risk of gluten contamination." How much gluten is in foods labelled 'gluten free'?